In case you’re new to this controversy, it’s yet another way good people waste time on the internet: getting huffy about how others attend church with their kids. For reference, my kids are 7, 5, 3, and 14 months. The 7 year old always goes, but it depends with the others. We can all agree to this: attending Mass is a profound privilege and the most important part of our week! We aspire to be reverent, to worship, and to not detract from other’s experiences of the same. We struggle to agree on children’s place in all this: they should be in the cry room; they should be in the front row; they shouldn’t come until they’re old enough to behave like adults; they should come and behave as they’re able to and we should welcome them despite their struggles. Our family has done it all: parents splitting up to go to Mass alone; me solo with all four kids; older kids with us; toddler at home; front row; back row; middle row; books and coloring; nothing; bribes of donuts; threats of trouble, etc. My experiences has taught me that nothing is more humbling than expecting and demanding that my small children behave a certain way in public. Especially in a public place that should be quiet and reverent. What works for you this week might not work next, same for this year to the next. Maybe you’re embarrassed and stopped going to Mass because your spouse isn’t into it anyway and suffering through temper tantrums and dirty looks is too much. Maybe your nine kids behave like angels and the older help with the younger. Maybe you’re desperate to actually pray during Mass and leave the little kids with a relative so you can have an hour of peace. Let the children come to Jesus. Please, be sympathetic if you think a family isn’t shutting their kids up and they should. Maybe one of them is on the spectrum and they’re doing their best. Please, be kind to the mom whose three kids under three are crawling around and crying and she’s not taking them to the back. Maybe her postpartum depression is crushing her. Please, don’t turn around and glare if two kids are scuffling in the pew while their mom is trying to discretely feed a younger sibling. Maybe it’s hard to feed a baby in public. If you think people aren’t being reverent at Mass (repeatedly) because of how they allow their kids to behave, first pray about it and then talk to your priest. Please leave the family alone. They’re probably exhausted and trying their best. Let’s give them the benefit of the doubt. This is lovely, thank you. My husband is an Orthodox priest so I know how hard it is to be alone with children during the services. Please, please show sympathy to the mothers. Offer to help. I have an almost 2 year old and a 3.5 year old and I am so fortunate that my parish family (and my last one as well) have been so welcoming of me with the kids. Talking is ok, walking around and visiting is ok too. I do try to maintain some control but try not to stress too much…they are kids and will learn to behave in church by being at church. I love this post! 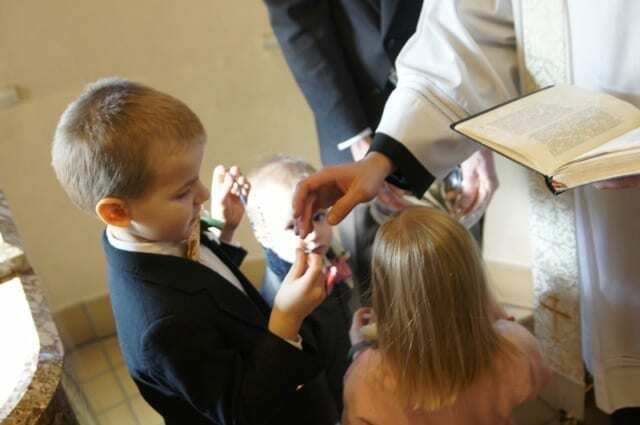 We have 3 boys, 4 and under, and it can get pretty crazy at Mass. Yesterday we had the sweetest experience–2 older couples came up to us after Mass and said that seeing us wrangling our three reminds them of when their kids were young and to hang in there and just keep bringing them to Mass. One of the older women said, “keep sitting by us! We support you!” It was the nicest thing and SUCH a gift to us!! Some weeks are VERY tough and these sweet people really were such a blessing to us! Hi Nell, first time commenter but have been reading for a while. Yes yes yes to everything!! My kids are 4, 3 and 1. We do Mass all different ways. Sometimes I crave going alone and when I do (rarely!) it is Heaven. Not going to lie! Any tips for a parish that doesn’t have a cry room? We bring a bag of quiet toys/books to church but sometimes it gets old real fast! Tried swapping out the toys, rotating books etc. the 1 yr old is the hardest to please. There also aren’t a lot of youngish people with babies/toddlers at Mass typically. the weekly family Mass sort of caters to the school aged kids who do the readings and can actually participate without throwing a tantrum ;) thanks! As the mom of 8 children, I know how hard it can be to attend Mass with all of our children. When my oldest was about 16 months old, we were attending Mass at a parish that had a priest visiting from out of state. My son was getting restless, so I handed him some object out of my purse (maybe a bottle of hand lotion, or something like that). He had just started to hit the pew with it, and if it was disturbing to others, it hadn’t registered on my radar yet. Well, the priest STOPPED right in the middle of Mass (later I heard they’re not *supposed to* do that) and said, “Would whoever is doing that please stop? This is not a circus!” Well, I snatched my son right up, and ran out of the sanctuary as fast as I could, cheeks burning with shame. I went outside where (providentially) there was a lovely “Mary Garden” and sat down on the bench and sobbed. I’m sure my thoughts were alternating between what an awful mom I was, and what a poorly behaved child I had. It’s definitely a good strategy to be kind to anyone who seems to be struggling with seemingly unruly children. You just don’t know what kind of a cross they are bearing. Our Church was very small and my husband and I were apart of the music. Part of the church’s blessing to us is that 2 lovely ladies would help out with them. My kids were 1 and 6 at the time and my 1yr old hated to be still when there was a long isle to run. Now when I see a kid bolt, or kick up a fuss, or what ever I think how wonderful that these kids are in church experiencing their faith with the guidance of their parents. Jesus loves those kids, and wants them to come to him. I definitely support the “offer to help” program…our family is of mixed culture and I often reflect on the differences. One time at mass me and the kids were solo and an older woman from my husband’s culture was sitting on the other end. When my infant was fussing to nurse and my toddler started freaking out because she wanted to be held, the woman came over and snatched up said toddler with a knowing smile. My daughter was partly surprised but mostly consoled and buried her head in the other woman and I couldn’t have been more relieved, though later I realized someone from my own culture would never dare. At our parish our deacon told us “never take a child out of mass, unless it’s for their own benefit” and for me that has ranged from discipline due to disobedience to a diaper change due to crying baby. The deacon also pulled us aside at another time and said “sometimes with little children it feels like you’re not able to get anything out of the mass due to distraction…but that’s ok. Keep going, it’s your special ministry.” Even to this day those words make me tear up, as does the appreciation when every older woman hurries over after a particularly bad day at mass and compliments “my little angles.” Saint Paul says “encourage one another and build each other up…” and we always need to do our best at that and boy is t appreciated. 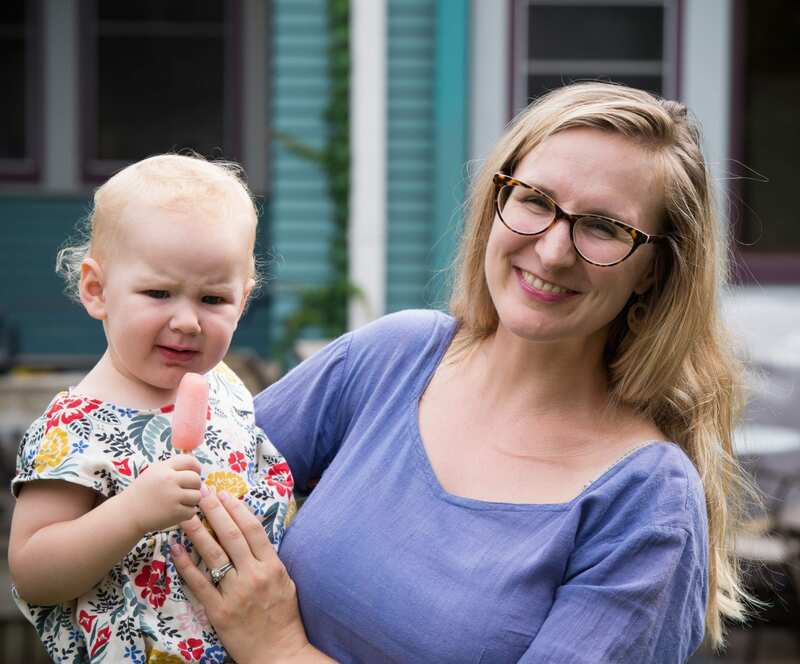 It’s not our job to parent other people’s kids, although I admit ashamedly I’ve been one to give a sideways glance to someone’s rowdy kiddo occasionally. But the Lord is kind in his rememberance to humble me with my littles shortly after. Lol.